The above infographic was the ultimate goal of our Made in America project. It shows every SFIA member company that manufactures in the United States and where exactly those companies manufacture their products. In white states, there are no SFIA member companies manufacturing their products, in yellow states there is a single SFIA member company factory, in green states there are 2-3 SFIA member company factories, in light blue states there are 4-9 SFIA member company factories, and in our two navy blue states (Massachusetts and Illinois) there are over 10 SFIA member factories. Illinois leads the way with a whopping total of 14 factories alone. 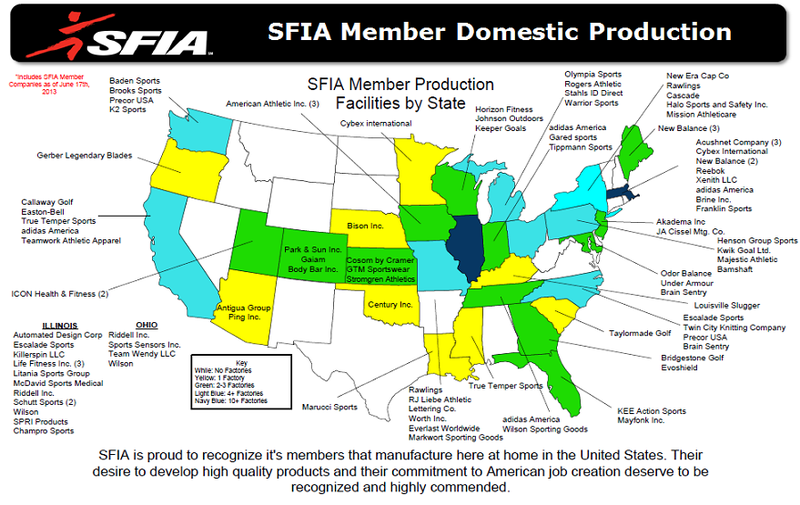 In total, we found 76 SFIA member companies that produced their products (or at least some of their products) here in America. All 76 of those companies can be seen in the above infographic. If you’re wondering how exactly we can to that number, we’re about to tell you.